Garth Snow was asking for 2nd round picks for each of Radek Martinek and Zenon Konopka. He didn't get what he was asking for either players, and thus they remained. That's actually what they would have preferred, anyway. 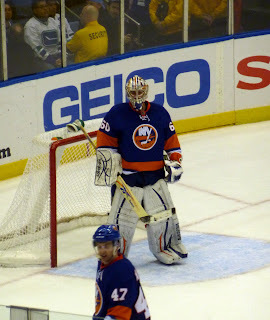 The only player that the Islanders did lose however was forward Rob Schremp. He was placed on waivers on Saturday, and had to wait until noon on Monday before knowing his fate. The Thrashers were fairly active in the weeks leading up to the deadline, and one of their moves on the final day was claiming him. Schremp obviously was a little disappointed in having to leave the Islanders, but in all honesty this works out for both sides. 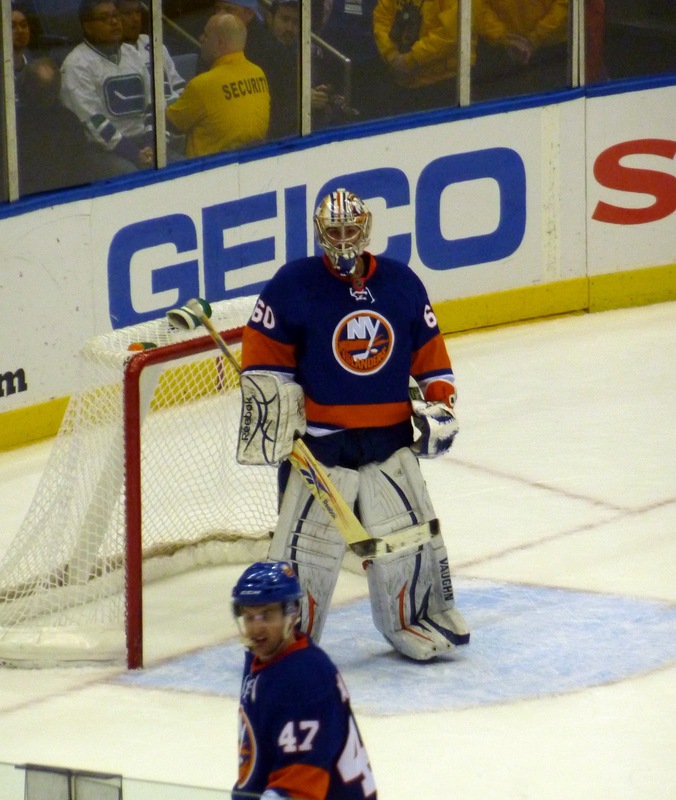 Schremp gets a fresh start elsewhere, and the Islanders get to move on. I had a comment from a reader who felt I was being a little tough on Schremp when I wrote about him after news broke of the waiver. However, I still stand by what I said. We make it a point, both in this space and on the show to point out guys who are having bad stretches or doing things wrong. We did numerous times earlier in the season. The team has generally played well in the last month though, and Schremp was one of the only guys not giving a complete effort, dogging it on defense and what have you. Even in limited time it was noticeable. The coaching staff gave him more than ample time to try and figure it out, but it didn't happen. Meanwhile, the Thrashers have been trying to find ways to improve their offense in any way that they could. Their pick-up of Schremp, along with the other moves they made leading up to the deadline show that they obviously understood the need for a jolt on the power-play. Schremp was always a fun guy to talk too, and quite the character. I enjoyed watching him grow last season, and enjoyed speaking with him a few times this season. All the best to him in Atlanta and the playoff push. There was a lot of interest in both Martinek and Konopka, but ultimately it wasn't enough to make opposing GM's jump at it. I agree with the way Snow handled himself this deadline. I was very adamant, both on the show and in posts here that Snow could get a 2nd round pick for Martinek if he wanted too. I was wrong, along with many other folks. However, that's what happens when there quite simply aren't too many sellers. Snow wasn't coming down from his asking price, and GM's balked. They instead chose to go with the same price from other teams, for players that were either better or more durable, in the case of Martinek. The only thing you could argue that could have been done differently is construct a carbon copy of that Niclas Wallin deal from last March (Wallin and a 5th for a 2nd). But even that was a stretch. The purpose here was to try and gather assets to use in the summer, and not necessarily to draft young kids. Snow tells Katie Strang of Newsday that he did take a look at some players who were under contract beyond this season, but was more just browsing. Perhaps that is something he will look at more in the summer. Deadline day wasn't as active as it was in the past, with only 16 deals completed. Some teams got things out of the way earlier this year. Deadline day, in all honesty got about what I expected this year. I didn't think it would be the type we have seen in the past (25-30 deals) but expected maybe a few others. The biggest deal was the Dustin Penner trade to the L.A. Kings for Colton Teubert, a 2011 first and a conditional 2nd rounder. The return is a bit much for a player like Penner, but for the L.A. Kings it's fine. They were so bad for so long, and have hoarded all of this talent at all positions. Having played well after hitting a bump in the road earlier, they could make this deal and are a better team for it. The Oilers, meanwhile picked up a really talented, hard hitting defenseman. It'll be interesting to watch that team grow together over the next season or two. We can only hope some seeds were planted for possible dealings in the summer. Many of the guys who didn't move today - Ales Hemsky, Steven Weiss, David Booth, etc - will surely be available in July. That's where some of those spare picks can come in handy. 1:07 - The Coyotes trade Scottie Upshall and Sami Lepisto to Columbus for Rostislav Klesla. Klesla was the last member of the original Columbus Blue Jackets, who came about in 2000-01. He's been out for the last month with knee problems, and has 3 years left on his deal at slightly over $4 million. Lepisto is a promising young defenseman, and Upshall is a quality checking line winger that Columbus has wanted. The Coyotes were looking for someone who can log minutes and provide a little offense from the blue line. A good hockey trade on both sides, and more importantly one that matches money - which is what the 'Yotes wanted to do. 12:49 - By the way, if rumors are true that Snow is looking for a 2nd round pick for Konopka, if he gets that he should take it and run. Ditto for a 3rd. 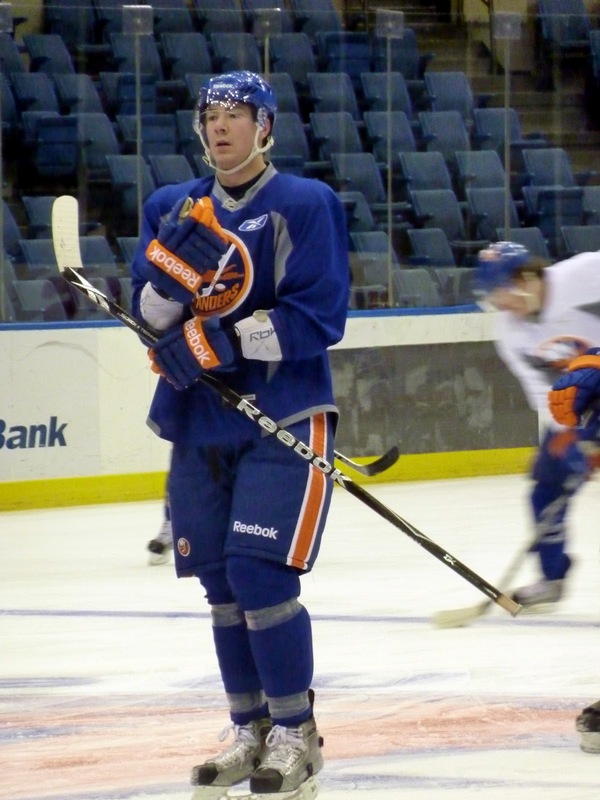 12:39 PM - The Atlanta Thrashers have claimed Rob Schremp off waivers from the Islanders. I'll have more on this later in a separate post as it relates to the Isles in a big way. Washington acquires Dennis Wideman from Florida for a prospect, 3rd round pick: This is a very good deal for the Caps. Wideman has fallen out of favor rather quickly in Florida, and is signed next season for $3.9 million. The prospect is 23-year-old Jake Hauswirth, an undrafted ECHLer. Mike Green is out for now, and this gives the Caps a solid puck mover for their first unit until Green comes back, when they can either shift Wideman to the 2nd unit or have him QB next to Green. In other waiver claims, Ottawa claimed Curtis McElhinney while Calgary got defenseman Brett Carson. The Carson claim may affect the Isles, as the Flames had been looking for a depth defenseman and were a potential destination for Martinek. Interesting return for Bergfors, who has fallen off considerably since his rookie year last season. He had been on the block virtually all year, and in the summer when the Thrashers had some issues in coming to terms on an extension. One would have thought the return for him would be better than a rental and a 5th, but Atlanta essentially had no space for him after getting Blake Wheeler and looking for other forwards all along. There are a lot of rumors flying around now. with the Thrashers re-signing Mark Stuart for three years, the d-man market now has guys in it such as Ron Hainsey and Johnny Oduya. This affects the Isles' Martinek market a bit. There were strong rumors about the Canucks being after Zenon Konopka, which is a rumor that has been out there since January, but a source in Vancouver has dispelled than. Daren Dreger of TSN notes that the Ducks may be interested as well. Still have a hard time believing that Konopka will be dealt. But again, as this deadline has taught us, expect the unexpected. 8:20 AM - Good morning and happy deadline day! As promised, this will serve as the post for the day with thoughts on deals made all around the league. As hockey fans in general, we really love days like this as teams try and improve themselves, or move with an eye towards the future. The first shot of the final 24 hours was fired by the Ottawa Senators, and NOT through a trade. The team announced they re-signed defenseman Chris Phillips for three years. This opens up the market for defensive defenseman considerable, as Phillips was the best available when it comes to players like that. Now, guys like the Radek Martinek's of the world become a little more valuable. Martinek, according to Katie Strang, is getting a lot of interest around the league. Look towards team like the Calgary Flames, Chicago Blackhawks, Vancouver Canucks and the Montreal Canadiens as teams that may be making a push for him. The first trade of the final day came from the Buffalo Sabres, who acquired winger Brad Boyes from the St. Louis Blues for a 2nd round pick. Before discussing this a bit, for those of you who have listened to us the past two years, you may remember that Sean and I were big fans of Boyes, and despite the Isles recent standing, would have liked him on the roster, signed through next season at $4 million. The Buffalo Sabres got a new owner in Terry Pegula last week, and although they aren't holding down a playoff spot, were looking to buy. Pegula went as far as to say there were "no financial constraints" (sound familiar?) and thus, gave the go ahead to add Boyes for the low price of a second. The Isles need to improve up front next season if they are truly serious about making the playoffs. With not many great, realistic options in free agency this summer a guy like Boyes is the type of guy they should be looking to bring in - it's not about this season, but next season. Boyes has struggled with the Blues the past 2 seasons, but has been putting up relatively decent numbers this year on a team devoid at center. Playing with John Tavares could have been a good match. Good solid move for the Sabres. Meanwhile, we now learned that the Blues are definitely in complete sell mode. 9:43 PM - Thanks to all of you who participated in the chat! It actually went much better than I anticipated. More importantly, you didn't have to suffer any of my usual issues with technology. That's always a plus. For those of you who missed it, feel free to watch the replay below. We covered topics surrounding the trade deadline mostly, with also some questions about the goaltending situation, the future of the franchise and the UFA period. Some great stuff in there. For those who missed our show live on Sunday afternoon, you can find it on our UStream or MyPodcast sites. We touched upon some of the same stuff that was mentioned during the chat, but also covered a variety of other topics that didn't come up in the chat. Tomorrow we'll have some kind of a running blog post up seeing as that works better for the both of us, unfortunately. But the plan is to offer some thoughts on deals that are made all around the league, for what they're worth. Again, thanks to all! Enjoy! 5:30 - Edit: I realize I have never done one of these before, so it's a little new to me. Hopefully there won't be any issues, but if there are just hang tight with me. I know it's on short notice, but I figure I'll try setting one of these up. I know Sean did a couple in the past that have been successful, so why not? Sunday's are generally not good for things like this, and I know tonight is busy between award shows and other sports, but I figure what the heck. We'll see what happens. Whatever you guys want to talk about, we can. Not just Isles notes, but around the NHL as well. The Islanders had a large and loud crowd on hand Saturday night to see them take on the Washington Capitals. Unfortunately, by the end of the night those who were in support of the Caps walked away happy. The Isles had a 1-0 lead on a nice looking goal by Kyle Okposo as he Faked shifted into the slot and snapped a shot past goaltender Michael Neuvirth. It was just Okposo's 3rd goal of his injury shortened season. The Isles would get a 2-0 lead on a knuckle ball shot that Neuvirth barely had a chance to see. It only took 33 seconds into the second period for Hamonic to get his 3rd of the season. It was at that point where the Caps began to press, and get some of their chances. The Isles had been out-shooting the Caps 20-9 at one point, but things slowly turned in their favor. Brooks Laich came out of the box after serving a penalty and Neuvirth hit him with a pass. He powered his way to the net and took a real nice shot that got through Montoya. Laich, who will be a UFA this summer, showed why many Isles fans on messages boards have been hoping that the Isles would make a run at him. He brings an element to a game that not many can provide, and certainly with much more consistency than anyone currently on the Isles. Mike Knuble and Alex Semin would score about three minutes apart in the third to give the Caps a lead they would hold on to. Knuble's goal was on a broken play in front after Jack Hillen was taken behind the net, leaving Ty Wishart as the only defenseman covering and Josh Bailey scrambling to try and help. Jack Capuano told us in the post game after that he thought they competed well against a tough team, but did have some lapses. The one glaring issue however, was the power-play. "I felt our power-play was flat tonight," Capuano was quick to point out. I couldn't agree more, and on Twitter I pointed out that the Isles were playing too much on the perimeter with the man advantage. It's fine to get some looks for the defensemen and to try and create rebounds, but the Caps blocked a ton of shots coming in from the outside, especially early on. That is when you have to make changes and adapt to what your opponent is doing. The locker room was very solemn after the game last night and for obvious reasons. Not only did they lose a game they could have easily won, but they also can be losing some friends. One look at Nathan Lawson's or Rob Schremp's face, and you could tell there was some pain there. That is the other aspect in all of this. However, at the end of the day it is Garth Snow's job to build a successful hockey team. Having spoken to both Schremp and Lawson in the past, I can tell you they would probably say themselves how they haven't stepped up in the way they should have. In the case of Lawson, he seemed like he feared his NHL career may be over just as quickly as it started. Regardless of that, we'll see what happens. There's a decent chance Schremp may be claimed by someone, while it's expected Lawson will clear waivers by noon Monday. There were a decent amount of scouts milling around the Coliseum, and the Isles even had scouts at some of the other games going around. There wasn't much talk in the press box of anything going on when it comes to the Isles. But as I said yesterday, expect the unexpected. If there's one thing we learned so far this year in the NHL, it's that almost anyone can be had for the right price. NEW NYI FYI EPISODE: As usual, Sean and I will be getting together for our latest installment of the NYI FYI radio show at 11 AM. Please feel free to watch us and participate by going to our UStream page. There is a chat room that is up and running there, and we always read thoughts and questions from there. You can also feel free to @ us on Twitter with your thoughts and questions. The Islanders announced on Saturday that both Rob Schremp and Nathan Lawson have been placed on waivers. The Schremp move comes as no surprise. When the Isles sent down Jeremy Colliton and Jesse Joensuu, I said on our Twitter page that it was most likely for a last ditch attempt at trying to showcase Schremp to the rest of the league. In keeping with what has been the norm for him for the better part of two months, Schremp was unimpressive in his 17:55 minutes of ice time. I let my feelings be known about how I felt about his performance in the game recap. Obviously, as expected there is no market at this time for a guy like Schremp. In a league where you value every player that is on your roster thanks to salary cap constraints, no one is trading anyone of value for a million dollar player with a ten cent head. For some guys, the second chance isn't enough. Sometimes they need a third or a fourth to finally "get it." Schremp is an obvious candidate for that because of his talent level. I'll say that there is somewhat of a chance that Schremp could be claimed by another team looking to possibly bump up their power play. But that remains a long shot. If not claimed, Schremp may stick around but could see significant time in Bridgeport for the last 20 games of the year. Lawson, on the other hand will not be claimed. If he clears, he is likely to stay up unless the Isles claim Ty Conklin, Pascal Leclaire or Curtis McElhinney on waivers, or make a trade for another one. I'm not anticipating them doing any of that, so I'd expect to see Lawson remain. 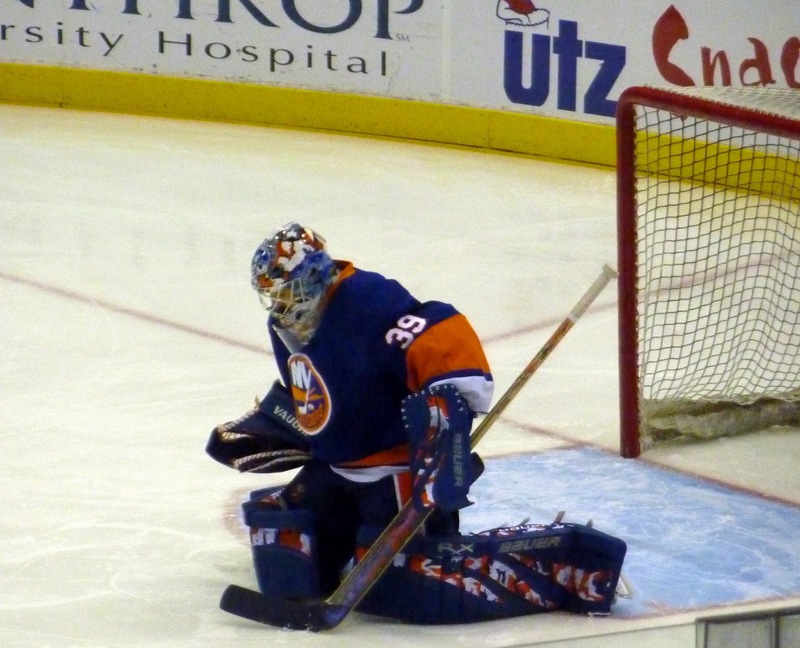 One other possibility is that Rick DiPietro could be close to returning. However, this is an unlikely scenario. We haven't heard anything from DiPietro as far as even skating on his own. It still appears that he is likely out for the season and is a non-factor when it comes to this move (this was the fourth week of that 4-6 week time period, by the way). Both moves are just to give the Isles some flexibility in the event they find a move they would like to make between now and Monday. It is not written in stone that they will no longer be Islanders. With the Islanders unlikely to make any moves of significance by Monday, I would be a little more surprised if they didn't remain in the organization or with the team. MARTINEK'S VALUE: Last Sunday, Sean and I got into a whole discussion about the deals that have already been made in the NHL and about how they may effect the market going forward. Let's face it - no one expected the amount of trades that have happened already. With a week left before the deadline, it's becoming harder to envision what players will still be around to move. In all seriousness, there is still a lot of players on trading blocks across the league. One thing we learned over the past two weeks was that defensemen are in very high demand. The league has suffered a lot more injuries than it has in past seasons, with teams such as the Montreal Canadiens being affected on defense. So far rentals like Tomas Kaberle headed to Boston, Eric Brewer went to the Tampa Bay Lightning and Ian White landed in San Jose. On waivers, Craig Rivet and Nick Boynton were claimed for teams looking for depth. But what about some other shut-down guys? Teams would love to add a player like Ottawa's Chris Phillips. But what about those that lose out on him? This is where the Islanders can potentially come in. It has been mentioned in various reports, for example in TSN analyst Daren Dreger's daily column, that the Isles have been shopping Radek Martinek around in hopes of landing a 2nd round pick for the oft-injured blue liner. Some folks may look at that and scoff, but look at what the market has brought back in return this season. Team's are not afraid to toss these higher draft picks around since it has been said that this is a "weak" draft year. White brought the Hurricanes a 2nd round pick. Brewer got the Blues a 3rd and prospect Brock Beukeboom. While Martinek isn't on the same level offensively as these guys, he is better defensively. Last season, the Sharks gave up a 2nd round pick to Carolina for Niclas Wallin and a 5th rounder. Wallin is essentially a clone of Martinek in both age, style and for the amount of injuries each have suffered. Wallin is no longer in the league right now, as some people suspect could be the case with Martinek after the summer. But this is the kind of deal Snow should be looking at. We know he likes to add first, second or third round picks. Martinek alone could be worth a 3rd with the prices that are being paid, and if you throw a 4th or 5th rounder in with him, Snow could easily walk away with a 2nd. While Martinek may be down with an injury for now, and something that didn't look serious, the fact that he is just listed as "day-to-day" for now is unsurprising. The Islanders can't risk any further injury to Martinek. As a matter of fact, it would not surprise me to see Martinek suddenly better and available for Tuesday's game in Washington if he's still here. The decision is Snow's. Last year, he decided it wasn't worth a 3rd or 4th rounder to deal away guys like Martin Biron or Richard Park, feeling it wouldn't make sense to take those two away from the roster with a return like that. Does he feel the same way this season though, with an oft-injured 35 year old defenseman in his final year, and with eight defenseman (Ty Wishart and Jack Hillen will be qualified) on the roster so far for next season, as well as Calvin deHaan knocking at the door? We'll find out over the next couple of days. CAPS vs. ISLES, "WHITE-OUT": The Caps visit the Isles tonight for "White-out the Red" day. Fans have organized a white-out for a game where it looks like the Coliseum may be pretty packed. The Isles have had great ticket deals, not to mention some hot play since the Pittsburgh game and fans have taken notice. They have let the team know that they are proud of them right now. The Isles come off a tough loss in Philadelphia. Meanwhile, the Capitals come off an even tougher one against the Rangers. Al Montoya needs to be at the top of his game once again, despite how much the Caps are struggling to score goals this season. The Caps tried to address that today by claiming Marco Sturm off waivers from the Los Angeles Kings. It appears we will not be playing for the Caps just yet. For those going, remember to wear something white. Isles Battle Back, Fall to Flyers in OT; Saturday "Whiteout"
The Islanders played the Flyers well enough to win. Unfortunately, the Flyers skill level shined through just enough to give them the 4-3 OT win over the Isles. This was a really fun game to watch because of the intensity that both teams brought. The Flyers did not take the Islanders lightly. The Isles were up to the task of trying to take down the big, bad Flyers. Although the game wasn't all that high scoring, it had the feel of a pond hockey game. There was a lot of north-south play, a lot of pressure put on the goalies thanks to turnovers from sloppy plays on both ends, and a ton of shots. The Islanders were ultimately done in by a long shift with a lot of scrambling in their zone as all four guys on the ice collapsed right around Al Montoya. That left Andrej Meszaros wide open to get a pass and take a quick wrister from just above the hash marks. Both Montoya and Sergei Bobrovsky made some really solid saves when they had too. There were some tough ones, like the Flyers third goal from Jeff Carter that deflected twice before skipping past Montoya. He would redeem himself in overtime though, when he made a nice split save when Kimmo Timonen was allowed to walk in from the blue line. Matt Martin scored two goals, including the one to tie it with 27 seconds left. His first goal was off of a nice feed from Micheal Haley. Martin positioned himself perfectly in the slot to receive the one-timer. Martin has been making the slot area his home the last two or three weeks, and that is an excellent sign. You can see that he is starting to think an offensive game slightly better even though the results have not completely come to fruition just yet. Frans Nielsen was perhaps the Isles best forward. He scored the first goal on a really nice wrister after beating his man one-on-one. Nielsen did a lot of the other stuff that you have come to expect out of him too. He seemed to be the straw that stirred the drink on his line, which consisted of Kyle Okposo and Michael Grabner. Both of them had some nice chances, thanks to some nice plays and positioning by Nielsen. Although they gave up a lot of shots, the Isles defensive unit was not as bad as I feared they would be. They blocked a ton of shots, and just tried to keep things simple. They didn't go out of position to do anything, and didn't try and manhandle any of the Flyers forwards in a one-on-one play. This Flyers team is so fast, experienced and skilled that you really can't afford to make any glaring mistakes against them. Mark Katic made his NHL debut, and didn't really get involved too much. But he looked pretty good a couple of times. He is a VERY offensive minded defenseman, but each time he pinched in deep he got back rather quickly. Being an excellent skater like that gives you the chance to be able to pinch more often as long as you are mindful of when you have to cut back the other way. I don't suspect he'll be here for very long with Milan Jurcina's injury not appearing too serious, but it's always good to get a young, still raw defenseman a taste of what could be in store for him in the future. On a negative note, in order to make room for Katic both Jesse Joensuu and Jeremy Colliton were sent down to the Bridgeport Sound Tigers. This meant that Rob Schremp found his way back into the lineup after three games as a healthy scratch. I thought that Schremp had an opportunity now to try and prove that he should not have been scratched and that he had his head in order, but it wasn't meant to be. What has gone on here with this player is really a shame when I think about how he was playing not even a month ago. He was even doing some of the little things right when not scoring, like back-checking or playing solid enough defensively. Now, he just plays like he's disinterested, and when he touches the puck it's like it has entered a black hole. He isn't even using his skills to keep the puck away from opponents. He seems to be trying to deke them out of their skates every time which usually ends up with Schremp easily being knocked off the puck. The regression here is such a shame. The Islanders take on the Washington Capitals on Saturday night in what will be their final game before the trade deadline on Monday afternoon, with trade talks heating up (or have they already boiled over?) around the league. LOTS of deals have gone down already, but there are still plenty of guys out there who will undoubtedly be looking for new homes over the next few days. Is Radek Martinek one of them? I know a couple of days ago I promised a little post on his value, and I still have that in the plans. I hope to get that out there in the next day or so (as long as he's still here, but I might put it up anyway even if he leaves before Monday). But, it's not a foregone conclusion that he will be dealt away. For those of you attending Saturday's game, the fans have organized a "Whiteout the Red" campaign, where fans are encouraged to wear white. The concept is cool, and would have been much cooler if the Isles walked away with three out of four points on this road trip, but it's a nice way to get behind the team and tell them you don't care about a draft pick and want to see them win out. Judging how well the Caps have played in NVMC in recent years, anything folks need to do to get behind the Isles is greatly encouraged. A whiteout seems like a nice way to generate some excitement among the fans and players. Kudos to the Isles fans who have put time into getting the word out. Hopefully, it hit enough people. If not for the play of goalie Al Montoya, this game probably doesn't end up as close as it showed on the scoreboard at the end. The Maple Leafs had many quality chances on a short-handed Isles team, but Montoya stood tall and was up to the task. He made some outstanding saves when called upon, especially with a weaker defense without Radek Martinek and after losing Milan Jurcina in the first period as well. There's one thing I have admired about the Leafs these last couple of seasons, and that's their ability to be first to lose pucks. This isn't something that has always happened during their lean years, but the last few times against them it seems to be the case. The Islanders were beaten to many of the loose pucks. This was the plan the whole time by the Leafs and was executed very nicely. The Islanders expected to have all sorts of time to get their shots towards the net but were always met with a Leafs player immediately putting the pressure on. Near the end of the game, the Isles seemed to realize that what they had done for the better part of two games was no longer working and that they had to try and get the pucks deep instead. That lead to a couple of nice shifts in the 3rd, but didn't produce any goals. For much of the first period, the Isles best line was their 4th line. It seemed that throughout their first few shifts, Zenon Konopka, Matt Martin and Micheal Haley had some good cycling going on. While they didn't have any great scoring opportunities, the puck possession was very good, and actually uncharacteristic from what we have generally seen from the 4th line this season. James Reimer stood tall as well and made several key stops against the Isles. This is another young goalie who came up and has really stole the show, and has been key in bringing the Leafs back into the playoff hunt. Phil Kessel, who has developed into an Isles killer throughout his young career, scored the winner with about five minutes left on a really nice looking individual play. If the Isles are to sustain any momentum heading into their home-and-home with the Washington Capitals starting this weekend, then they need to get a point our two out of Philly. This is a place that hasn't been good to the Islanders at all for three years now, so the odds are stacked against them. But given performances against top teams such as Pittsburgh, Buffalo and Los Angeles in the past two weeks, stranger things have happened. Let's hope that Martinek is healthy, not only for the good of the Isles on the ice but also for the possibility off of it (trade wise). I have been putting together a little post on what his value could be for the team, both if he stays and what he could bring back in a trade. Be sure to look for that in the next day or so. EDIT: For those who haven't yet, remember to check out the latest episode of the NYI FYI show by either going to the podcast or the UStream page. It seems now a days, with each game the Isles play a new player is stepping up to be the hero. Against the Panthers on Monday afternoon, it was Matt Moulson. Moulson scored two consecutive goals in the first period, and added an empty netter with a couple of minutes left in the 3rd to get his 5th multi-goal game of the season as the Isles won 5-1. The win was the Isles sixth in their last seven tried, and they moved one point behind the New Jersey Devils, whom many people are talking about as a team that is still in the playoff conversation. The task is very tall, but the Islanders are taking all the necessary steps. The fact that this team came out hard for a matinee game when those haven't been the kindest to this team in recent years - especially those against opponents they should handle well - is a very encouraging sign. There weren't many weak points in the game, and the Isles had a really complete effort once again. Aside from Moulson, Josh Bailey was a standout to me. His goal was a thing of beauty and the move is something he is starting to pull off a little bit more. For him, it's all about the consistency. Earlier this season, we saw play like this and then it came to a sudden halt. Will he be able to sustain it for more than just these few games? John Tavares was a standout too, more because of his individual plays along the boards and uncanny ability to hold the puck deep in the zone. We saw him make Dennis Wideman look silly on one particular play in the corner, where Wideman didn't even know where the puck had gone. Tavares is developing some decent speed to go with that skill he has. A little more work on the skating in the offseason and he's going to be a superstar for sure. Al Montoya was solid once again when he had to be. He had a couple of sketchy moments playing the puck in the third, but nothing cost him or the team. Just watch out for that in a game where the score is closer. All in all, a fun day for a large crowd that was on hand. The Isles travel to Toronto for a game right away on Tuesday night before heading to Philly on Thursday. The tests get tougher for the team, but they need to take it one game at a time. Apparently a big crowd is already expected for Saturday against the Washington capitals. Three out of four points on this mini road trip could make it even larger, with a bigger contingent of Isles fans. In the past few weeks after acquiring Al Montoya, many fans have wondered "who is this guy?" All they had to go on was two very shaky relief performances with some juicy rebounds. On Saturday night, Montoya got his first start in an Islander uniform and made a statement to all those who showed up and saw good old what's-his-name in net: "You can call me Al!" Montoya stood tall and made some key saves as he went on to shutout the red-hot Los Angeles Kings 3-0 in front of another large crowd. As the game went on, Montoya let up less and less rebounds and looked strong with each of the 35 saves that he made. However, Montoya couldn't have done it without the help of some strong defensive play on the part of the Isles. The defense was much better than Thursday against the Bruins as they kept the Kings into the low percentage area's. That is something they had been doing throughout their nice little run, and none of it was there against the Bruins. I feared for the worst, thinking about how young this team is and that old habits tend to rear their ugly heads at times. But my fears were quickly washed away as the Isles got right back on track and back to doing the things that have made them successful recently. That is some solid proof that this team has learned from some of their mistakes in this overall underwhelming season, and that's something that can't be overlooked here. Matt Moulson scored two goals against his brother-in-law Jon Quick. They brought his goal total up to 23 for the season, making the Isles the only team in the entire NHL to have three guys with 23+ goals on the roster. Of course, this would not be possible if it weren't for the strong recent play of Michael Grabner, who has now not scored a goal in his last two games. But he has kept up his solid play away from the puck which is a good sign. There really isn't much else to pick apart in this one without going through every player on the ice and pointing out what they did. We were able to see what happens when the boys are firing on all cylinders and more importantly all on the same page. Each defensemen had their moments, with the most notable being Andrew MacDonald. His play wasn't as good as it could be of late (even before he got hurt) but he was stellar while playing with the face shield and all. We generally see players have problems to adjust to the shields like that, but he seemed to be just fine. Meanwhile, the Kings lost in regulation for the first time in 11 games - which covers a span of 29 days. This is a huge accomplishment for this Isles team, as the Kings have really propelled themselves back up into the Western Conference playoff picture with their run. Collectively as a group, the Isles didn't hesitate to throw their weight around. Even players who do not normally hit at the very least tried to. This has been something you saw at times over these past few weeks too. This is an Isles squad that seems to have created a challenge for themselves. Many guys are playing at the top of their games right now and have developed an "us against the world" mentality. This is what I like to see, and hope that it continues for the remainder of the season. The Isles next game is a Monday matinee at the Coliseum against the Florida Panthers. Matinee games haven't been too kind to the Isles in recent years, especially against opponents that the Isles should be able to run with. With many folks having Monday off (but neither of us do, of course) I would expect another big crowd. Hopefully they can treat them to a similar effort as Saturday night, and not the one they gave a big crowd on Thursday. It's very safe to assume Montoya will get his 2nd straight start. NEW NYI FYI AT 11 AM: Be sure to tune in to our UStream page for the latest installment of NYI FYI at 11 AM as we talk about the week that was for the Isles and the NHL in general. It was a rather crazy one to boot, so it should be a fun show. In the span of just two games, we got to see both the best and worst of Nate Lawson. Lawson didn't look good at all against the Boston Bruins, and they chased him just a couple of minutes into the 2nd period, after scoring their fifth goal against him. He looked very uneasy and sloppy in covering the posts. When he came out of the net trying to make what would normally be a confident play, he seemed to slide way out of position. We already knew about some of his rebound problems, and we saw some of those again Thursday night. Al Montoya came in and looked OK. He has issues with rebounds as well, and you can certainly see signs in his game that tell you he's a guy who has played only against NHL talent for the better part of five years, but his effort on Thursday was better than Sunday - which wasn't hard to accomplish. It appeared like there was a bigger crowd than normal at this game. It's a shame that the Isles came out with this kind of game. People were obviously excited to see this team coming off the brawl and four straight wins. At the very least, they were expecting an exciting game and figured the Isles would give the Bruins a run for their money. Within a couple of blinks of the eye, it was 2-0 Bruins and the Islanders were reeling and scrambling all over the place. Quite frequently throughout the night, the Bruins had periods where they were just dominating puck possession and all five skates for the Isles would be deep in the zone allowing the Bruins to get better shots. That created a lot of the rebounds that they would cash in on. The Isles can't afford to get into lapses like that. A game like this can ruin all of the good things they have worked on the last couple of weeks. You don't want old habits sneaking back into your game. Meanwhile, Josh Bailey and John Tavares had good efforts in this one. Tavares scored a beauty of a goal for his first of the night, and that's something we've seen more and more out of him. He's well on his was to crack the 30-goal plateau this season, which would be a huge accomplishment. Bailey scored again on a nice slapper in the slot after Blake Comeau's shot was blocked. Bailey has been racking up some assists lately, and has started to put the puck in the net again over the past two games. Hopefully he can get out of what has essentially been a season long slump for him. The Isles don't have much time to stew over this one, which is good. They get right back at it Saturday night against the Los Angeles Kings. PARENTEAU RE-SIGNED: On Thursday afternoon, the Isles announced that they have re-signed winger P.A. Parenteau to a one-year extension, worth $1.25 million. As Sean and I have said on the show over the last couple of weeks, while we are still hoping that there is a better option for Tavares to play with after trades or free agency, you can't argue with bringing him back for another go. Parenteau is on pace for 50 points and hasn't been terrible on the power-play. He has improved as a player over the last couple of months, but there are still some holes in his game here and there. Obviously, this is a deal that has many people wondering if it means the Isles aren't serious about adding another forward or two over the summer, but I'm not going to be quick to jump to that conclusion. Last summer, the Isles used what few bullets they had in the gun to go after defense. With a number of options for next season on the blue-line already, I still feel that the Isles are going to try and use their bullets this summer to go after forwards. Should they fail in their attempt to bring in someone from the out side, then they have Parenteau as a fall back, one that they know can give them 50 points skating along side Tavares and Matt Moulson. If they are successful in bringing someone in, then they shift him down to the 2nd or 3rd line while still giving him significant power-play opportunities. One thing I do think that this confirms is that Rob Schremp will no longer be a part of this team in 2011-2012. Schremp has been in and out of the line-up all season, and has also been demoted to 4th line duty now. As the Islanders as a collective unit try and get better, Schremp has regressed. The game after Jack Capuano talked about having some "selfish players," Schremp was the only one who was affected as that was the fist time he was demoted. I saw some of the comments fans were making after the Parenteau announcement. I'm firmly in the camp that it is way too early to say that this affects how the team makes their decisions in the summer. Last season, Garth Snow said he wanted to go hard after defensemen, specifically two. Early in free agency both Milan Jurcina and Mark Eaton were brought in. When the opportunity presented itself at the end of July, Snow dealt a 3rd round pick to Anaheim for James Wisniewski. While Wisniewski wouldn't stick around for very long, Snow saw the opportunity there to possibly get better despite having a full (when healthy) defense. So hold tight and be happy that a player who has shown some success and shown that he wants to be here returns for just a year at a fair price. We'll see what the remainder of the season and the off-season brings before we revisit this. The Islanders came into Ottawa on Tuesday night winless in their previous four meetings there. This trip however has just had a whole different feel about it. As a matter of fact, there is something very different about this team. When I walked into that locker room after the 9-3 win over Pittsburgh, the aura hit you immediately. I was curious how long that would last. So far, it has made for some impressive hockey. After beating the red hot Buffalo Sabres in a pond hockey game, the Isles and Sens played a much more contained game, with some good goal tending and a heck of a lot better defensive support. As has been the story for the better part of two weeks now, the little engine that could known as the Islanders came back from one goal deficits twice, and ultimately won the game in the shoot out 4-3. Nathan Lawson made his return to the line-up since getting injured on January 21st. He was solid in what would be his first NHL win. There were times where you could tell he was still trying to get the kinks out, but when I think back to the little we've seen of him this season, I can say that I felt the rebounds were not as bad as they had been. It still needs some work, but as far as he goes tonight, he was solid. It helped Lawson that the Islanders had an overall solid defense in front of him. There were a couple of breakdowns, like for example on Ottawa's third goal with Milan Jurcina laying a big hit and all of the Isles players standing to Lawson's right. Fortunately, it didn't happen as much as it had in games past when Lawson has played. The shoot out was a lot better this time around for Lawson. He was predictably schooled by Alex Kovalev, who made such a sick move. The little half turn had me fooled all the way as well. It helped that Lawson had some support there too, from Rob Schremp going into his bag of tricks and Frans Nielsen scoring...on a forehand?! Brian Elliot expected the switch to the backhand the whole time, just as I think about everyone in the hockey world did tonight. Instead they got a quick wrist shot and a very confused Elliot, Jiggs McDonald and Butch Goring. Travis Hamonic had a very solid game, blocking a number of shots and throwing his body around. On the power-play, he is looking more and more relaxed. We really needed him to be tonight, since Andrew MacDonald hurt his nose in an awkward collision with Chris Kelly. Kelly was traded after the game to the Bruins for a 2nd round pick, so we'll see him again on Thursday. Michael Grabner had another two point night, but this time only scored one goal. But it was still a thing of beauty after failing to convert on a breakaway move trying something new as Grabner missed the shot but gathered the loose puck behind the net and wrapped around to score one for the 2nd time in as many games like that. Solid effort there and having that speed is what really gives him the ability to score on that when maybe 90% of the league wouldn't be able to. Congrats to Josh Bailey for scoring the Isles 3rd goal, his 7th of the season and first in the last 21 games. Must be nice to get that monkey off his back after having some good chances over the last two weeks. The Sens had some tough luck in this game, losing both Chris Campoli and Sergei Gonchar to injuries early on. I have to tip my hat to them for playing really well despite only having four defensemen for more than half the game. It's not easy to manage against that, but they seemed to do well and not over work anyone. The Isles now come back home on a roll, with some more tough opponents coming in the form of the Bruins on Thursday and the Kings on Saturday. The Bruins are arguably the best team the Islanders will have faced in the past couple of weeks, and are now starting to make some moves to their team. Will they have another new player aside from Kelly, like Tomas Kaberle? The rumors are out there, and they do indeed need a defenseman. Kaberle or not, there is a really big test coming in. It seems like there is going to be a decent crowd on hand too, given the Isles recent stretch of hot play and show of toughness. As expected, Michael Grabner was named the NHL's first star of the week after scoring eight (!) goals in four games this week. Grabner's performance was one of the few things that did not go unnoticed in a week that was full of fights and comments. For Grabner, this is the 2nd time in the past week the 23 year old has been named one of the NHL's three stars. The past weeks performance helped Grabner reach 24 goals, giving him a tie for the rookie lead and moving him into a tie for 13th overall in the league as well. Grabner is firing on all cylinders right now and doing everything right, on both sides of the puck. If anyone told me he was going to get better as time went on, I would have believed it. But if you told me that it was going to take about 40 games to see what we are, I'll admit I would have probably laughed a bit. I always knew Grabner was an awesome talent, but didn't think it would take this short a time for his hands to catch up to his feet. Congrats to Michael for the honor. LEMIEUX/KONOPKA COMMENTS: Some folks have asked me what I felt about Mario's comments after the league handed down their punishments. In all honesty, he is entitled to his opinion. However, I feel he is wrong, and obviously not paying attention to what is going on here or what the real issue is (officiating, which I have written about enough here these past few days). Of course, Lemieux is being labeled as a hypocrite, as he should. He employs the guy who was called one of the top two dirtiest players in the entire league recently in Matt Cooke. Max Talbot meanwhile, instead of trying to prove that he has usefulness as far as offence is concerned, is too busy whacking and running guys, and then refusing to fight when challenged. Those who live in glass houses should not throw stones, Mario. If the league would learn how to properly make calls, such as the various ones that come from guys like Cooke and Talbot, then the players wouldn't be playing with such a chip on their shoulder. I'll tell you what Mario. You say you need to rethink if you want to be a part of this league. You said that you feel the NHL has failed. When Cooke tries to end someone's season again, talk about how the NHL has failed to keep the players safe. When Jordan Staal sucker punches a fighter again in the face with his glove on, talk about the NHL failing there. Let me venture a guess: he won't. This is hypocrisy at its finest folks. Zenon Konopka had some fantastic comments today, in response to what "Super Mario" had to say. The best thing was when Konopka said he's going to remove Lemieux's poster from his door at home. I would too, if I had one. I was never a fan of his though, so I don't have that issue. Oh well. Konopka has been pretty consistent in saying that they have to take care of their own players, regardless of what the outside says or does. For as long as the league will have crummy officiating, this will keep happening. And speaking of officiating, Howie Rose echoed the sentiment Sean had on our show this past Sunday as far as giving certain players "preferential treatment." I realized more now that Sean may be on to something. Within the first minute of the Capitals - Coyotes game on Monday night, a penalty was called on Derek Morris. Of course, the way the play unfolded consisted of Alex Ovechkin skating into Morris' stick as he was defending, causing it to come up a bit to the mid section. Veteran referee Don VanMassenhoven, standing 15 feet to the right and watching the play unfold as Ovechkin came around the net, made no call. The referee at center-ice however did - a much younger, more inexperienced ref. Why is that? Is it because it's Ovechkin and you give him the benefit of the doubt? As time goes on here, it's things like this that are frustrating everyone and make me think that Rose or Sean could be on to something. Absolutely no need to make that call there. If VanMassenhoven wasn't calling anything there when he was the guy who could see it all, then I'm convinced there was nothing to call. The bashing of the Islanders will continue and I'm fine with that. In all honesty, folks are getting out of hand with their opinion on the Islanders actions, refusing to look at the big picture and understand what the heart of the issue is here. As Konopka stated, Boston and Montreal can have this huge fight and it's the greatest thing since sliced bread. But when the Islanders get frustrated because of non-calls and the Penguins skating after players with this cheap-shot aura about them, it's terrible. Stay classy Mario. Stay classy Pittsburgh. Stay classy NHL. The game against the Buffalo Sabres on Sunday afternoon was anticipated by various people all over the hockey world for a multitude of reasons. For Islanders fans, the game presented a new challenge. The Isles had to find a way to come up big against another team that has been on fire lately after the statement they made in the last game. While the path getting there was a bit of a roller coaster ride, the result is exactly what we all could have hoped for. Michael Grabner not only scored what has become his normal two goals for this game, but added a third for his 2nd career hat trick as the Isles went on to beat the Sabres in a wild one, 7-6. The other Isles goals came from John Tavares, Ty Wishart, Milan Jurcina and Blake Comeau. Grabner really did it all once again. Between the penalty killing, the speed, the average of two breakaways a game for the past month and the stripping opponents of pucks to create chances the other way he has done it all. Howie Rose said that he has completely run out of superlatives to describe Grabner, now tied for the rookie lead in goals in the league with 24. Mikko Koskinen didn't look too great in this one, with the rebounds once again being the biggest issue here. This is the one are of his game that needs a ton of work, and the style the Sabres employ brought out that weakness. Unfortunately, Al Montoya was no better as he was seemingly unable to hold on to any pucks that came his way, giving up some bad goals and some really good chances to the Sabres. If that's going to be the norm from him, then we may need to look elsewhere once again. I'm hoping that it was an aberration, with a combination of nerves of being in his first NHL game in a while and having to come in while fairly cold in the 2nd period. The defense as a whole was pretty poor. The most noticeable one was Wishart. There were a couple of Buffalo goals that came due to him stepping up towards the wrong person and just being completely out of position, like for example on the 3rd Buffalo goal. He did score a goal at a key time, however his defensive game still has a few holes in it here and there. I can see why he is still considered to be in the prospect/project stage by some. At any rate, the Islanders get another win to go along with what they have been putting together over the last week or so. It's also coming at a time when guys like Grabner, Tavares, Matt Moulson and Kyle Okposo are racking up points. This is a good thing to see. The Isles show next rolls into Ottawa, where they'll face a team that's struggling big time. They are now without Mike Fisher, who was traded for draft picks to the Nashville Predators. It always seemed like Fisher had good games against the Isles, so perhaps that is an advantage there. - I do have some things I want to say on Mario Lemieux's comments about the NHL's handling of Friday's events. I'll have something on that tomorrow as I am still working on organizing what to say here. - Sean and I got together and recorded the show as we always do on Sunday. You can watch the broadcast of the show on our UStream page here, or download the podcast version for our podcast site here. - Click here to see the Islanders feature on Chris. When I thought about what the NHL would hand down as punishments to the Isles and Pens for the events on Friday night, I was expecting the worst. I figured Trevor Gillies was going to get 11 games, Matt Martin six, and Konopka one. I expected Eric Godard to get his mandated 10, plus one for being a 3rd man in. I didn't really figure many suspension would come from the Penguins side, honestly. I was a little off on my guesses. The NHL didn't go to the extreme I thought they would. Gillies got nine games, while Martin got four. Konopka didn't get anything, which means it's safe to assume that the league didn't see any evidence of anything wrong with any of his shifts. Earlier I pointed out that it was going to be tough to prove, and that was most likely the case - as it usually is. I figured the Isles would get fined too, but was thinking more of $250K - $500K. That may sound excessive, but when I have Bob McKenzie of TSN telling me to expect the league to come down hard, this is what I am anticipating. The fact that the Isles were only fined $100K is no big deal. All in all, the punishments fit their crimes. Max Talbot got away with trying to hurt Blake Comeau last week, and Matt Martin sucker punched him to remind him of what he did and was attempting to injure him. Gillies elbowed Eric Tangradi in the head just moments after he gave Jack Hillen a concussion after running him into the boards. Disappointed that Tangradi got off free, but like I said the Isles did what they had to do to step up for all of the players that the Pens have injured/attempted to injure for the last couple of weeks. We'll see what kid of effect this has on the team now as far as who gets a chance. Gillies was in and out of the line-up anyway, battling Rob Schremp for time. Schremp now gets to return, while Micheal Haley gets to stay in the line-up to keep some of that toughness there. To be honest, the fact that he gets nothing is excellent in the sense that he was perhaps the best "performer of the show," if you will. His fight with Craig Adams was a decisive win that I haven't seen by an Isles player in quite some time. His goal was also a thing of beauty as he showed that he can actually play the game too. The Isles need to keep their solid play going though and continue their statements with a strong game Sunday in Buffalo. HESSEL FEATURE: I want to take the opportunity to welcome some of you newcomers who have found you're way over to NYI FYI. It's not the most exciting site in the world, but that's something that I intend to change over time. I hope you enjoy what you see though, and continue to join us. We have a number of links for various things we do, so please check those out as well. I promise some of them are more exciting looking! For those of you unaware, the Islanders did a feature on me and NYI FYI recently. They posted it on their site today when many fans were looking for highlights and news from Friday's excitement. The amount of people that have clicked on to the site in the past day it outstanding. Andrew LeRay of the Isles wrote a great piece, and to be quite honest with you I'm flattered. I'm very appreciative to the Isles for giving us the unique opportunity to be a part of the media, and we hope it's something we can continue to do year after year. Of course, we're both very appreciative to you friends/fans who are following us. We're really enjoying this, and glad to see how many of you seem to enjoy it as well. We're excited about all we've done to make this more fan-oriented, and it seems to be paying off. So once again, thanks to all of you, and join us in welcoming all of the new readers and listeners! NYI FYI, 11 AM SUNDAY: Speaking of listeners, I'm sure many people are interested in the unique item we provide in addition to the blog - our radio show and podcast. Every Sunday, Sean Croft and I get together and record a show. We recently added UStream to our repertoire, which brought a live element back to our show that we lost upon leaving C.W. Post. We do the show at 11 AM, and the way to access us live is to watch right here on our UStream page. There's a chat room component that goes along with it, and folks have been leaving comments or questions that we'll answer at some point on the show. Immediately after we complete a show - which can be at any time as there is no time restriction - the show will be placed in the archives on UStream, and we also upload an audio copy to our My Podcast site for those who prefer to listen on their MP3 players. Remember to join us at 11 AM as we talk about A LOT of items and hopefully have fan responses to read. Feel free to send us e-mails, leave comments here on the blog @ us on Twitter, write to us on Facebook or just simply use the UStream chat room during the live show. For both the Isles and their fans, I'll start off with some bad news: The next time these two teams get together is on April 8th. When thinking about how to talk about all of this, I decided to keep it simple. What happened on Friday night was not just a direct result of what the Penguins did to the Isles in their last meeting. It was a lot of emotions that were bottled up inside not only after that game, but the ones on Long Island against the Senators and the Maple Leafs too. Zenon Konopka talked a lot recently about how players run guys like John Tavares and Matt Moulson all the time and not get called. He warned that they weren't going to stand for it much longer. Perhaps the game against the Leafs, where Tavares was knocked down twice on questionable hits was the straw that broke the camels back. This was ice hockey as it oughta be when your team has been beaten down, abandoned by a Russian goalie in semi-retirement, been called “Lowly” in the headline of every game story (win or lose) and opponents like Talbot are taking liberties with your skilled players. The Penguins lost Evgeni Malkin for the remainder of the season, while Sidney Crosby is out until March with his concussion. While secondary players have shined as the Pens went 7-3 in their previous 10 before last night's game, Talbot was not a factor in that. He instead has decided to go after teams top players, and not just on the Islanders. I didn't realize that this was part of his game, but now after seeing him go after Blake Comeau, Radek Martinek and Mikko Koskinen that is what he is becoming. There is no sympathy from me as far as what happened to Talbot last night. He's had it coming to him for the last few weeks. The Islanders are facing suspensions for their actions, as they should. Trevor Gillies, Matt Martin and Zenon Konopka all have face-to-face meetings with the NHL. That could mean suspensions of six games or more, but doesn't mean it will necessarily happen. I'm expecting Martin and Gillies to get those lengthy suspensions based on early thoughts from those connected to the league. Konopka is being investigated for a shift he took in order to fight, one that will will be difficult to prove that it was against the rules. I'm a little surprised that Micheal Haley doesn't appear to be facing suspension, and that could because of the control of the refs. More on this in a moment. In short, the Islanders did what they had to do both on the scoreboard and in their fighting. Again, this wasn't about the Penguins. This was about a disrespected team gaining respect for things that have culminated over the last few weeks for a team that has had various bouts of adversity this year between injuries, coaching changes and losing streaks. If you read comments from fans all across the hockey world, a lot of respect has been gained. Last night I sat in the press box and had the pleasure of sitting next to Tom Liodice, formerly of the Tiger Track Blog. I asked him some questions about Haley, from a hockey player standpoint. He told me that he can play the game and not just fight. This was shortly before his rush that lead to his beautiful goal. Liodice said that skating was not something he had seen before but obviously worked on. We'll see if it leads so something more. More play like that, where he proved that he can do more than just fight, and he may have a spot on the 4th line of the team over a guy like Gillies. - Tavares, Moulson and Michael Grabner all hit the 20 goal mark last night for the Isles. The team had only two last season and stand a good chance to add one more this season in P.A. Parenteau. Congrats to all three. - Penguins announcer Paul Steigerwald said that the Islanders are the "embarrassment" of the NHL, and went as far as calling players names and acting like a child on-air. I've come to expect stuff like this from him. As far as embarrassments go, what do you call Matt Cooke then? Or a no talent guy like Talbot, who decides rather than focus on his offensive game with the two biggest sources of offense out, decides to start taking runs at top players? This is all the attention I'll give to a guy who is an "embarrassment" to his profession and also happens to be a broadcaster for a team that was the last "embarrassment" of the NHL from 2001 to 2006 - when they practically had moving vans waiting outside Melon Arena, just like you could argue the Isles may have too. See ya in April, Steigs. - I mentioned earlier about Haley's incidents, and how it appears they may very well go unpunished. We've already established that this was a culmination of events, from over the last few weeks. This kind of game, the third of it's kind in the last two weeks, is something that is coming out more and more. Bob McKenzie of TSN said he expected the NHL to come down hard for suspensions from this game because of the "Slap Shot culture" the league has been having lately. Over the summer, the league lost a number of respected veteran refs - yes, Kerry Frasier included. Frasier was on XM Home Ice a couple of weeks ago, talking about how refs prepare for games that pit two teams against one another with recent history. The NHL had no choice but to turn to rookie refs this season, many of whom have had all sorts of issues making correct calls, preventing cheap hits to the head or areas around the head of players. Konopka isn't the only player to notice liberties are being taken with star players. It's happening all over the league. I think it's pretty clear that the lack of calls and extremely poor officiating over the first half of the season has lead to what happened when the Dallas Stars came to Boston two weeks ago, when the Canadiens entered Boston on Wednesday and when the Penguins came to Long Island on Friday. Maybe these refs were unprepared. Maybe they didn't think anything exciting would happen given how un-tough the Isles have been really since Eric Cairns left in 2004. The reffing has been a very contentious area in the NHL this season, and seems to be on the top of the list of problems that fans, teams and players seem to have this season. I enjoyed what Haley did last night, but there is no reason why the ref should have felt the need to let him roam free and fend for himself. Sure, they had their hands full with Gillies barking from the door way to the locker room at this same time, but there are four officials on the ice for a reason. If the NHL is serious about making a statement based on what happened, then they need to look at themselves in the mirror too. Yes, suspend players because in all honesty, some deserve to be and they will tell you as much. But come up with some sort of training program to break in new refs because obviously whatever program you set up last summer has failed miserably. Your thoughts and comments are welcome as always. Feel free to leave them here, shoot us an e-mail or @ us with your thoughts on Twitter. Or, you can join us for our live NYI FYI broadcast on Sunday at 11 AM and make your voice heard there. Regardless of what the outcome would have ultimately been, I would have to say that the Isles latest visit to Montreal made for one of the more entertaining games we have seen all season long. Fortunately, the night ended in a win for the Isles, and the first ever NHL win for goalie Mikko Koskinen. Koskinen made 37 saves and stopped all four that came at him in the shootout to earn the win. And boy, did he earn it. Koskinen came up with some big saves numerous times, including a diving stop on a fluttering puck that James Wisniewski tried to smack in at the goal line. As much as Koskinen tried to down play nerves prior to his first game, you could see how much more composed he was against Montreal. He obviously prepared much differently for this one. I would say the one thing that bothers me about Koskinen's game is that he goes down into the butterfly too early. He's a big goaltender, and the report that Montreal had must have outlined this weakness in his game because they took a lot of shots up high. However, during the pre-season I wrote numerous times how impressed I was with both Koskinen and Kevin Poulin as far as reaction time, especially on glove saves. Koskinen made some nice saves with the glove, often reaching up for the high shots. If you're going to make saves like that, then how early you go down is only a minor issue. Michael Grabner did his normal thing - scored a goal - and added another one for goiod measure. He also made some really nice defensive plays, and used his speed once again to his advantage. His first goal came after he split two defenders and created a mini-breakaway for himself. Just unreal. The waiver wire acquisition now has 19 for the season, just five behind Logan Couture of the San Jose Sharks for the rookie lead. Josh Bailey didn't get onto the score sheet, but he had a good game. He has been quietly getting his legs back, and is showing signs of a player poised to break out of a prolonged slump. He had two excellent chances tonight, both created when he stripped Montreal defensemen of the puck. The overall effort tonight was excellent. The Canadiens played a tough game the night before against the Boston Bruins, and it showed but only very early in the first. They had their legs going by the time they got their first goal, but the Isles never let up and kept peppering Alex Auld with some good shots. They didn't keep it to the perimiter, either. They kept trying to push the defense back and get guys in front of the net, and all game long that happened. It was very refreshing to see. The Isles need to do more of the same Friday night at home against the Penguins. They are without Evgeni Malkin and Sidney Crosby, so it is imperative they try to take advantage. Al Montoya will most likely be called up. Koskinen played so well tonight that I almost feel the Isles have to start him against the Pens if he ends up staying over Joel Martin. However, as much as it might sound weird to say this, I am a little bit interested in seeing what Montoya can do at this level. I will be watching this one live, and will be sitting in the press box. More thoughts to come Friday morning or afternoon. I wasn't all that hopeful that the results of Kevin Poulin's MRI would come back with good news. When the injury happened, it looked pretty bad immediately. As it turns out, it's just as bad as many expected. For the 2nd time, Kevin Poulin has dislocated his left knee cap. Just like the other time in juniors, this one too will require surgery. Poulin will be out for the remainder of the season. Despite the Isles wanting to send the goalie down to be the everyday starter at the AHL level, Poulin played better and better each night and was working on cutting down on some of his extra movements, which seemed to be what one of his weaknesses were. As you can see from the quote above, Poulin knew this was his chance to show what he can do as a 20 year old against NHLers. He was always a guy who had a lot of promise, even though he fell to the 5th round in 2008, ironically mainly due to injury and inconsistency. That chance ended when Poulin's skate got caught in a rut on the infamous Coliseum ice, causing the goalie to immediately crumble to the ice. It was a site that made many fans all around the world bury their head in their hands. For a while, it appeared as though it suddenly became Mikko Koskinen's turn to show his stuff. After being named the starter to replace Poulin against the Maple Leafs, he promptly gave up two goals on the first two NHL shots he saw. Koskinen would settle down a bit, and didn't receive a heck of a lot of support from his teammates, who appeared to look rather deflated at times due to Poulin going down. During the game, Garth Snow began to make some calls around the league, looking for a team that had a 3rd string goalie that he could get on the cheap. Wednesday saw a lot of action as far as transactions in the NHL. After the Leafs dealt away defenseman Francois Beauchemin, goalie Jonas Gustavsson was pulled from his start in the AHL. For a few hours, people wondered what was going on there and tried to connect the dots, wondering if this was the 3rd string veteran that Snow was targeting. Since James Reimer has come up and looked really good for the Leafs, both J.S. Giguere and Gustavsson have lost starts. But word came down that Gustavsson actually was having problems with his heart rate again and as a result, was removed from the game. So the search for a new goalie went on. On our Twitter account, I posted that I felt Snow was going to add a goalie of the Martin Gerber or Curtis Sanford variety. Both of these guys actually fit the bill for what he was looking for. Needless to say, many were a bit surprised when the news hit the wire about the Isles trading a 6th rounder this summer to the Phoenix Coyotes in return for Al Montoya. Montoya, better known by Isles fans as the last goalie to get into a fight with Rick DiPietro prior to Brent Johnson, was the 6th overall pick by the New York Rangers in the 2004 draft. Thing's haven't worked out for Montoya though, now 25. To date he has played all of five games in the NHL, all with the Coyotes. Montoya was struggling this season in San Antonio of the AHL, but overall has compiled a 96-72-7 record since joining the league in 05-06. His overall numbers haven't been horrible, but this season is obviously one of his worst ones yet. Since Montoya still is fairly young, I'm assuming Snow saw the potential for something here. I don't think there is anything else potential wise there, but stranger things have happened. For Montoya, he gets a chance to finally be an NHL goalie for 28 games. If he plays well he gets noticed, if not by the Isles then by some other team. If not, then he'll still be talented enough to be an AHL guy, maybe even for the Isles. It is assumed that with Nathan Lawson really close to returning, Koskinen and Joel Martin will head back down to Bridgeport while Montoya and Lawson handle the nets up with the Isles for the balance of the season. Montoya will go to Bridgeport, but join the Isles when they return home from Montreal. He may even start against the Penguins on Friday. Let's just hope that he doesn't get hurt now. It may have taken a while for Ty Wishart to get his chance to show his stuff on the Islanders blue line, but when that time came it ended up being a fairly successful first weekend. Wishart, acquired from the Tampa Bay Lightning in the January 1st trade that sent beloved net minder Dwayne Roloson the other way, was called up from the Bridgeport Sound Tigers on January 31st, the day after the NHL All Star Game. Wishart had five assists in 12 games with the Sound Tigers after posting a 4-14-18 line in 31 games with Tampa's AHL affiliate, the Norfolk Admirals. In general Wishart appeared to play well - nothing spectacular, but didn't always make any glaring mistakes. The play was enough for the Isles as they decided it was the time they gave Wishart his chance. He didn't get into the Isles first two games after the break, which were both on the road. The team returned to Long Island and held practice on Friday morning, giving us our first look at the 6'4", 222 pound defenseman in person. I headed out to practice Friday with the main goal of speaking a few minutes with Wishart in order to get to know him better as a person and a player. I feel like there is only so much you can get by reading reports and watching videos online, so what better way than to see him in action, even if it was just a practice scenario. I watched Wishart fairly closely from the end where I was sitting. Seven defensemen practiced, with Wishart often running drills with Bruno Gervais. There were a couple of instances where he screwed up, like making a bad pass, and he would show frustration. Others weren't as animated as he was when making a mistake. For a guy his size, Wishart's skating isn't the worst in the world. It's an area of his game that is still a bit raw, but very serviceable. He is pretty mobile, and his defensive awareness is very good. When he was drafted, one of the points of emphasis of his game was that he can think the game at a high level and is almost always in the right position. But this is something many Islanders fans have figured out by now after finally getting to watch Wishart in his Isles debut. Wishart played just over 15 minutes against the Senators on Saturday, registering two assists and a couple of hits. After practice on Friday, I sat down with Wishart. One of the questions I asked was if he had been told when he would get in a game. All he could say was that there was some talks about playing Saturday, but there were no guarantees. He got that chance and in my opinion, made the most of his first impression. Speaking of first impressions, when I went up and introduced myself to Ty I could see immediately why he was named Norfolk's "Man of the Year" after this past season. A great kid with a great personality. Hopefully, things work out for him and he develops while he's here. Chris Hessel: A lot of Islanders fans since the trade are wondering about Ty Wishart. Could you tell us a little bit about yourself - as a defenseman, how you got into hockey - things like that? Wishart: Well, obviously it was the same thing as most Canadians. You grow up with the game. I grew up playing on a little pond in Ontario and went out West and continued from there. As far as my game, I think I'm a two-way defenseman and hopefully I get a chance to get into the line-up and show the fans what I can do. CH: Is there a player out there you grew up watching, a defenseman, that you try and emulate yourself after? TW: No, not really. I didn't watch a whole lot of hockey growing up so I don't really model myself after anyone I don't think. I just try to play my own game and try to do the best I can. CH: How did you find out about the trade (to the Isles)? TW: The GM came in after the game in Wilkes-Barre and told me I got traded and we let the guys know and I went to Bridgeport from there. CH: As a young player, you've been traded first in a package for Dan Boyle, who was very important to his team and then you were traded for Dwayne Roloson, another important player. What does that say to you as a message of faith, in this case from the Islanders? TW: I don't know, but I'm definitely getting a pretty good trade card going on here! It feels like they want me and that's always a good feeling, going to a team that will give up a pretty good guy for you. That's definitely a pretty good feeling. CH: Last year and this year both in the AHL, you seem to have picked up your play from a few seasons back. What's different for you, what has changed or what has gotten better? TW: Confidence. My first year in the league I was pretty tentative and maybe didn't see the plays that I seem to be able to make now. It's definitely a huge confidence thing. ISLES TAKE ON LEAFS: Wishart and the Isles prepare to take on the Maple Leafs Tuesday night at the Coliseum. The Leafs are a team that has struggled overall this season, but have played better of late in front of young net minder James Reimer. There is potentially some off ice problems going on behind the scenes with Phil Kessel and head coach Ron Wilson, but both have come out and denied that. Brian Burke meanwhile has said neither of them are going anywhere. Kessel has not registered a goal in 10 games, and has been pointless in the last five. The Isles need to come out hard here and not take anything for granted. Kessel has good career numbers against the Isles (8-5-13 in 16 games) and this could be his opportunity to break out of his slump. MISSED OUR SHOW? If you missed us live on Saturday for our latest installment of NYI FYI, you can catch up by going to our UStream page or, as always, the MyPodcast site. The fact that the Isles won by a score of only 5-3 is quite impressive when you consider how the game began early in the first. In what has become a rare occurrence, the Islanders actually scored the games first goal on a nice play with Matt Moulson hammering home a rebound in front. It was the wingers 1st since signing his new deal. The teams would go on to trade goals, leaving little time in between. After 20 minutes, we were all tied at three. Kevin Poulin had some trouble on the first couple of goals that the Sens scored. The first one I'm pinning on both he and Milan Jurcina, who didn't have one of his finest nights. There needs to be some better communication there, and as Howie Rose mentioned on the telecast, perhaps they haven't played together enough to have those kinks worked out. Jurcina has been in and out of the lineup all season with various injuries. Rob Schremp was able to break out of his little slump, notching two goals and earning the game's first star. I still wasn't overly impressed with his play, but being in the right spot at the right time is something he was getting away from, normally opting to curl back to the blue line for a low percentage shot. Glad to see him get back to some of the little things that were making him successful. Hopefully he can continue to turn it around. Ty Wishart made his Isles debut and registered two assists. He looked comfortable out there and made some good first passes out of the zone. I had an opportunity to speak with Ty after practice Friday. We played that interview during the show that we recorded on Saturday. I plan to write a story on it in the next day or two, so be sure to look for that. All in all it was a good effort for the Isles in what ended up being a scrappy game. The Senators took some unusually dumb penalties but were fortunate enough the Isles had some problems with the man advantage tonight expect for that one big 5-on-3 coming out of the 2nd period. Robin Lehner replaced Brian Elliot after the 1st period and provided much better rebound control and made more timely saves. Overall, the rookie stopped 23 of 24. The Isles have a couple of days off before taking on the Maple Leafs at home on Tuesday. To listen to the show recorded Saturday afternoon, including that Wishart interview, download it from our podcast site or watch through our UStream page. I decided to use my Friday off today to take the time and head over to the Coliseum to watch practice. I made the decision at pretty much the last minute, and in the end it turned into quite a busy day. No sooner did I get there and take a seat and start scribbling some items in my notebook, the Isles staff informed me that I had to go to the locker room. Now I don't get the internet on my phone at this time, and left my house at about 11:45. So I truly had no idea what was up. ﻿Before entering I asked what happened and was told Rick DiPietro was going to speak. My immediate thought was "uh oh." I turn from the hallway to the entrance of the locker room. As soon as I enter, DiPietro removes his aviator sunglasses to address those of us there. Upon seeing the condition of his right eye I immediately frowned, as would a parent walking into a room to see their child had done something bad. I kept thinking about the strong feelings I had after the fight where I essentially said it was foolish for DiPietro to be engaging in stuff like this no matter who did the initiating. Just from looking at the swelling on his face I knew it was going to be a while. Arthur Staple of Newsday began to ask about the knee injury, and I was confused at first. I soon realized though what was going on here, that this was more than just some broken bones in his cheek. My initial thought after hearing him speak and seeing the damage was that he was done for the year. The Isles are saying he's only out 4-6 weeks. I'm not one to tell people I'm right and things like that, but I'm sticking by my prediction. I don't expect to see him for the remainder of the season. DiPietro however, remained optimistic that he would be able to return sooner rather than later. "I hope so, but I can't tell you how long it's going to take my bones to heal." Meanwhile, DiPietro is also suffering from swelling in his knee, the same problem he has always been battling. "It's the same stuff we've been dealing with. I'm sure the rest will help." When asked if he had any regrets for getting into the fight with Brent Johnson, DiPietro gave an emphatic "no." "I'm not. I'm sick of losing, our team's sick of losing. You never expect to go into a fight and get smashed in the face that hard but it happens, he landed a good punch and we move on." While DiPietro maintains that he has to move on, the Islanders now have to try and figure out their goaltending situation moving forward. After practice, Jack Capuano said that nothing had been decided on goaltending from here on out yet. "I haven't even talked to Garth yet. Obviously, we do have some prospects and I'm sure Garth will make that decision here shortly." This afternoon, the team announced they signed goalie Joel Martin, currently backing up Mikko Koskinen in Bridgeport, to a two-way contract and kept him in Connecticut on loan to the Sound Tigers. Right now it appears that Koskinen is the favorite to come up with Nathan Lawson still ailing. Koskinen has had a number of issues in Bridgeport this season though, and still appears to be a ways away from living up to the billing as a 31st overall pick. As far as NHL options, there are a couple that are out there. The most talked about one is currently Ray Emery. Emery has been battling serious health issues of his own in the past few years, but appears poised to make a return to the NHL. He and his agent are expected to sign a deal somewhere shortly, where he could start in the AHL for conditioning and work his way back. A report from Friday says that the Anaheim Ducks and Philadelphia Flyers were pursuing Emery, as well as a third team. The feeling on that 3rd team is that they are "at a point where they're prepared to make an offer" to sign the goalie. The Islanders are certainly at a point where they can make an offer. The Islanders passed on Mike Smith on waivers, but if he goes on re-entry then he could be another option. The Toronto Maple leafs have been shopping J.S. Giguere with the emergence of James Reimer. Of course, if Evgeni Nabokov ever comes to his senses he would be welcomed with open arms now. One has to wonder if he is looking at this situation and changing his mind if he was serious about "visibility for next season." My guess is that he isn't since it was proven otherwise. Right now, the number one is going to be Kevin Poulin who is obviously up for the challenge. The plan was to try and get Poulin back to Bridgeport at some time to become the number one starter there again, but now it appears like he won't be headed down there until the Isles season has been completed. "It's bad luck for Ricky but I think it's a great opportunity for me and I'm just looking forward to playing some games." Poulin continued, saying "The team has helped me a lot. My defense has blocked a lot of shots the last few games." Capuano was quick when asked about his confidence in the 20 year old going forward. "Poulin's been playing great. Kevin wants to be that guy, he puts the pressure on himself to be that guy and every game he wants to know who's starting." "I'm not worried about Kevin." Many Isles fans aren't either, given his 3-2-1 record in nice games, with a .929 SV% and 2.37 GAA. In all honesty, it would be nice to see the Isles pick up one of the aforementioned goaltenders but I have my doubts. It certainly goes against their thinking of just two weeks ago when they claimed Nabokov, but I think they are fine with just rolling with Poulin for a majority of the games from here on out and mixing and matching Koskinen and Lawson for the other games. We'll have to see what happens here. -Mark Eaton showed up for the first time in what seems like a while. Upon entering the locker room, the players eyes lit up and they all flocked around him to see how he was doing. He was telling players that he was pain free, but still couldn't out pressure on his surgically repaired knee EDIT: hip. -Zenon Konopka was very excited about a potential Twitter account. Apparently, as team communications coordinator Jesse Eisenberg pointed out, someone created a fake twitter account for the often outspoken center. He really wants his own account now, and every time he talked about it the media relations folks kept looking at each other with understandable petrified looks. We'll see if he gets his wish or not. -Trevor Gillies practiced on the 4th line today with Konopka and Matt Martin. Rob Schremp wore an orange jersey with Josh Bailey, Blake Comeau and Jeremy Colliton. I'm assuming that there's a strong chance that Schremp is an odd man out next game with Gillies getting back in. It makes some sense after what happened last game. The Senators have guys like Matt Carkner and Chris Neil. -I spoke to Ty Wishart after practice for a small getting to know you type blog entry. He's a good guy with a good personality and a good sense of humor, as he poked fun of himself and how many times he's been traded already. So look for that in the next day or so. NYI FYI on Saturday: Due to the Super Bowl on Sunday and the fact that everyone has plans, we decided to do the show on Saturday this week at 1 PM. Be sure to tune in by going to our UStream page to listen to us live. There you can also participate in the chat room and submit your questions or thoughts for us to read on air.